Coca-Cola, or Coke, is a carbonated soft drink manufactured by The Coca-Cola Company. Originally intended as a patent medicine, it was invented in the late 19th century by John Stith Pemberton and was bought out by businessman Asa Griggs Candler, whose marketing tactics led Coca-Cola to its dominance of the world soft-drink market throughout the 20th century. The drink’s name refers to two of its original ingredients: coca leaves, and kola nuts. 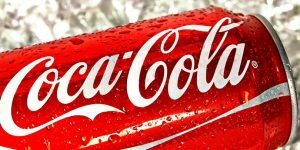 The current formula of Coca-Cola remains a trade secret, although a variety of reported recipes and experimental recreations have been published. The Coca-Cola Company produces concentrate, which is then sold to licensed Coca-Cola bottlers throughout the world. The bottlers, who hold exclusive territory contracts with the company, produce the finished product in cans and bottles from the concentrate, in combination with filtered water and sweeteners. A typical 12-US-fluid-ounce can contains 38 grams of sugar. The bottlers then sell, distribute, and merchandise Coca-Cola to retail stores, restaurants, and vending machines throughout the world. The Coca-Cola Company also sells concentrate for soda fountains of major restaurants and foodservice distributors.